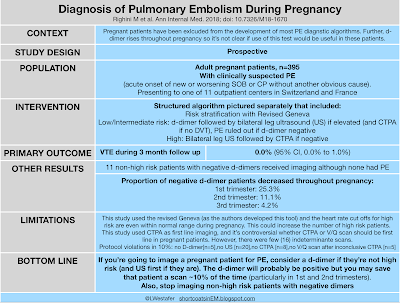 the short coat: Pulmonary Embolism Workup in Pregnancy: Is D-dimer a Thing? 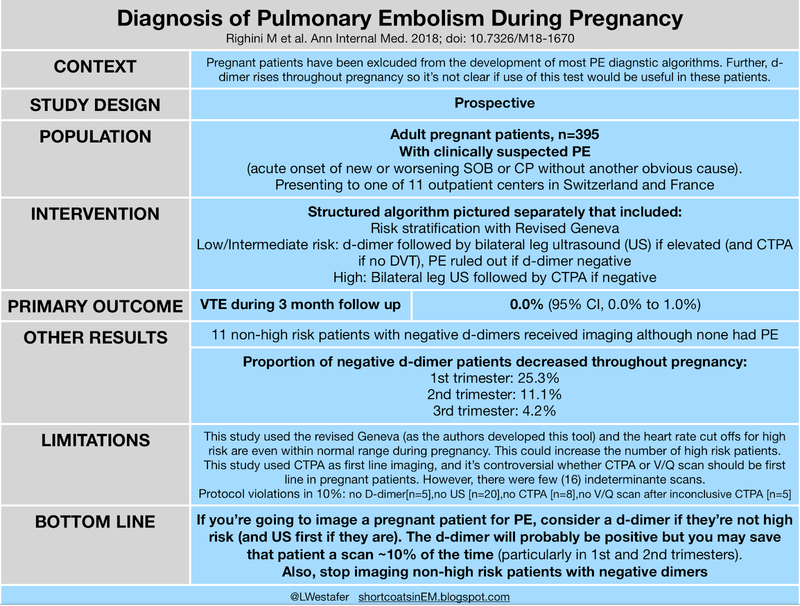 Pulmonary Embolism Workup in Pregnancy: Is D-dimer a Thing? The Gist: D-dimer rises during pregnancy and few patients will have a normal d-dimer by the third trimester. However, integration of d-dimer into a diagnostic algorithm for pulmonary embolism (PE) could reduce the need for CT scan by ~11% . The next step - gestational age adjusted d-dimers. 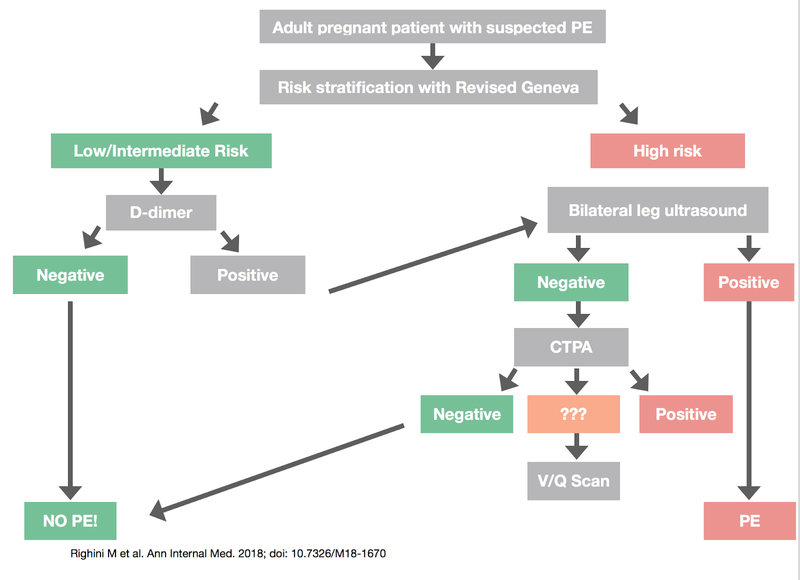 The workup of pregnant patients for PE is complicated. 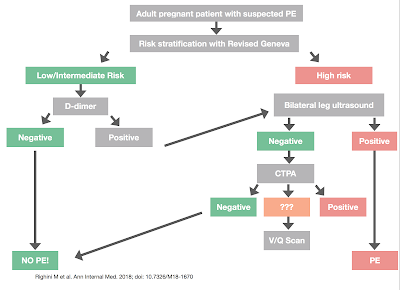 Pregnancy is considered a risk factor for PE. However, the algorithms and risk stratification tools widely used excluded pregnant patients in the development phase. Additionally, the use of the d-dimer in pregnancy is controversial in pregnancy. It's known that the d-dimer rises through pregnancy, making the utility questionable. While some have attempted to determine gestational age adjusted d-dimer cut offs and one expert recommends a first trimester cutoff of 750 ng/mL, a second trimester, cutoff of 1000 ng/mL, and a third trimester cut off of 1250 ng/mL, this has not been formally studied in PE[2,3]. Further, the risks of the objective tests in the patients may be greater due to radiation to the fetus and maternal breast tissue. A group in Switzerland (also the creators of the Geneva Score) tested an algorithm on nearly 400 patients which appears promising. See algorithm and study summary below. Further research will be needed to ascertain if an elevated dimer cut-off based on gestational week can be used and if another risk stratification tool performs better in this population. For example, the Revised Geneva has age >65, which is essentially incompatible with pregnancy as well as heart rate cut offs of >75 or >95 beats per minute, when the average heart rate in pregnancy rises to >90 beats per minute. 2. Murphy N, Broadhurst D, Khashan A, Gilligan O, Kenny L, O ’donoghue K. Gestation-specific D-dimer reference ranges: a cross-sectional study. BJOG . 2015;122:395–400. 3. Kline JA, Kabrhel C. Emergency Evaluation for Pulmonary Embolism, Part 2: Diagnostic Approach. J Emerg Med. 2015;49(1):104-17.